The holding of the drills deserves attention within the wider perspective of the defense relationship between the two sides. This month, Australia and Brunei held another iteration of an exercise between their ground forces. The drills, which were held for the first time since 2010, put the spotlight on efforts by both sides to continue to develop their defense ties amid wider domestic and regional developments. Australia and Brunei have long had a defense relationship as part of their wider bilateral ties that date back to when Brunei gained its full independence from Britain in 1984. Defense collaboration was formalized via a memorandum of understanding on defense cooperation inked in 1999, and covers various areas such as visits, exchanges, training, exercises, and information exchange involving key services. The furthering of defense ties has continued on into 2018 as well. This includes routine meetings by both sides, such as the joint defense working committee meeting held in March, visits and exchanges by officials on both sides, and cooperation on issues such as counterterrorism that has been a key area of collaboration and where both sides have inked a separate agreement. On the exercises component of the defense relationship between the two sides, an example of this is Mallee Bull, held between the Australian Defense Force and the Royal Brunei Land Forces (RBLF). Mallee Bull has been seen by both sides as an important platform for facilitating military-to-military cooperation, providing an opportunity to enhance interoperability and skill building in various areas. This month, both countries held another iteration of Exercise Mallee Bull. 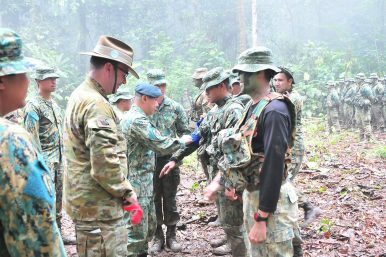 The exercise occurred from December 7 to December 17 at Kampong Benutan, and it featured about 28 personnel from the Australian side and 60 personnel from the Brunei side. According to Brunei’s defense ministry, the exercise consisted of three phases of administration and force integration training, search and destroy operations, and administration and recreation. The Australian side was led by Mark Vincent Vele, and the Brunei side was led by Abdul Hakim bin Arifin. The closing ceremony was officiated by Khairil bin Haji Ismail, the chief of staff of the RBLF, and Peter Moore, the commander of 13th Brigade Royal Australian Army. Unsurprisingly, few specifics were released by either side about the plans for future exercises such as these, and, to be sure, this is just one of several interactions that emphasizes the broader relationship that both sides have on the defense side. Nonetheless, as both sides continue to develop their defense relationship, Mallee Bull will continue to be among the various interactions to watch on the exercises front to see how the two countries are faring. The two sides held this year’s iteration of Maju Bersama amid a series of other defense interactions this month. Challenges Ahead for Brunei’s Military as It Marks 57 YearsWhat Did the Pakistan Army Chief’s Brunei Voyage Achieve?What’s in the Brunei Military Chief’s First Pakistan Voyage?Brunei-Thailand Military Ties in the Headlines With Land Force Commander Introductory VisitWhat’s Behind Brunei’s New Military Budget?